Most runners don’t do anything half way, they give it their all. It’s a great trait to have when you’re training for a marathon or running a 5K, but it can get you in trouble when it comes to stretching, going too strong can be a bad thing. Often what really tight muscles need to loosen up is a gentler stretch. Stretching too hard can cause muscles to lock up, making the stretch counterproductive. 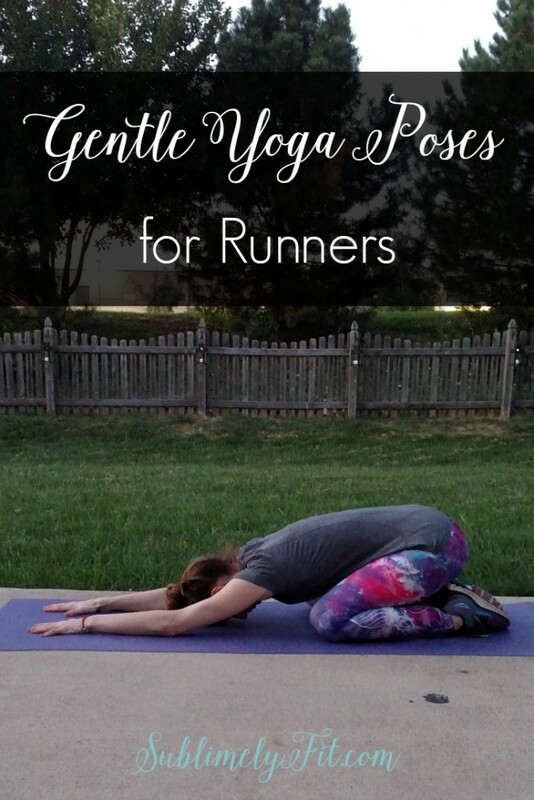 These gentle yoga poses for runners will help you ease into your tight muscles, helping the muscles to relax. Disclaimer: I am a yoga teacher, but I’m not your yoga teacher. Always listen to your body and modify any yoga pose to meet your body’s needs. If something doesn’t feel right in your body, don’t do it. 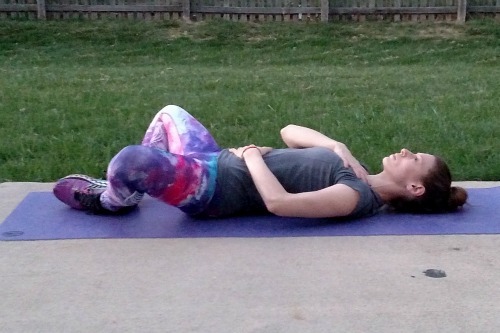 Rag Doll is a wonderful pose to relax into to release the backs of your legs, and it’s one of the first yoga poses I come into as I practice yoga after running. Keep your feet stacked below the spot where your thigh bones meet your hips, which should be about two fists’ distance apart. Bend your knees as much as you need to until you feel a moderate stretch through your hamstrings. Release any tension in your neck, letting your head hang heavy. Runners have notoriously tight calf muscles, which is why Gorilla is one of the great gentle yoga poses for runners. You can modify Gorilla so you get just the right amount of stretch. If your hamstrings and calves are tight, try leaving a bend in your knees. You can also bring your hands to a chair or to blocks, depending on your personal flexibility, to help you ease into the pose. Another option: roll a blanket and place it beneath your toes. 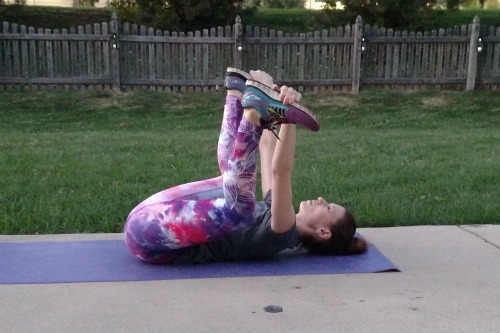 This will also lift your toes and help you stretch through your calves. Again, you can bend your knees as much as you need to, and/or bring your hands down to a chair or blocks to modify. Runners! Can’t find the right amount of stretch? Try these gentle yoga poses! 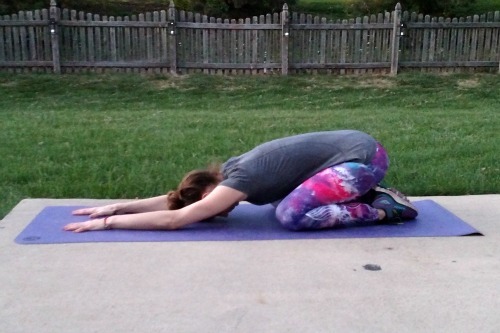 Child’s Pose with wide knees is a great relaxed hip opener, making it a fantastic gentle yoga pose for runners. 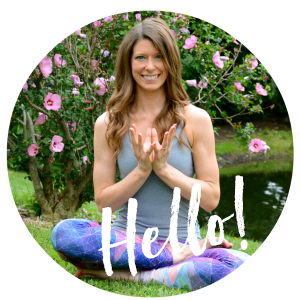 Taking your knees wider, closer to the long edges of your mat, will provide greater opening through the hips. Place your knees so that you feel a comfortable opening that’s not too harsh. You can bring a folded blanket beneath your knees and/or between your calves and thighs to help take some of the pressure off of your knees. 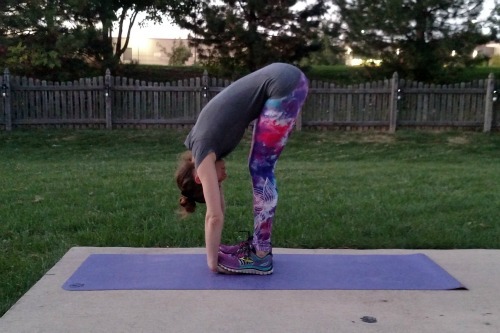 Bringing a yoga block beneath your forehead can also help make this pose more accessible. Reclined Bound Angle Pose is a wonderful pose to relax into to open the inner thighs. Keep the soles of your feet together, pressing the outside edges of your feet together. The inside edges of your feet may come apart if you’re very open. You can take a block, blanket, or pillow beneath your knee for support if you need a slightly less intense stretch. Again, find a position where you feel a gentle stretch so your muscles can relax and open. Marichi’s Pose is a great way to open through the outer hips and glutes and is an nice alternative to Pigeon Pose or Cow Face Pose. Gently twist your opposite shoulder to your knee. You can further intensify by wrapping your arms around your knee, pulling your torso deeper into the twist, or you can come into the full pose and hook your opposite elbow to the outside of your bent knee, keeping your elbow bent as your palm faces forward. 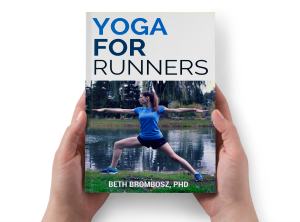 Most runners have very tight hip flexors, which makes Supported bridge one of the great gentle yoga poses for runners. In Supported bridge, you can ease the hip flexors into opening, changing the intensity of the pose by changing the height of the support under your hips. Place something solid under your hips, a yoga block if you have it, something of similar height and support like a solid box if you don’t. 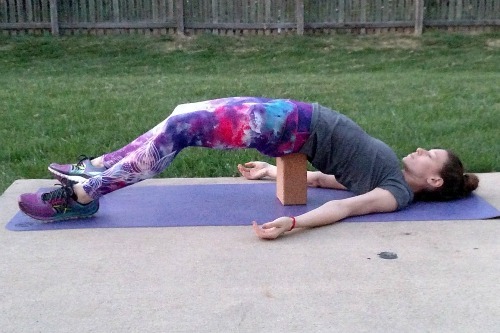 Even a foam roller under your hips will allow you to hold a low bridge. The higher your hips are, the more opening you’ll feel, so find a height that’s comfortable for you to maintain. Happy Baby is a great hip opener and is just plain fun to try. Bring your knees close to your armpits, keeping your feet flexed and your knees at a 90 degree bend. Grab the outsides of your feet, pulling your knees down toward the mat with your arms. Begin to gently rock side to side, massaging out your lower back and opening through the hips. Bringing your knees wider and pulling down more strongly will intensify the pose. use coupon code bethb for 15% off all their apparel! 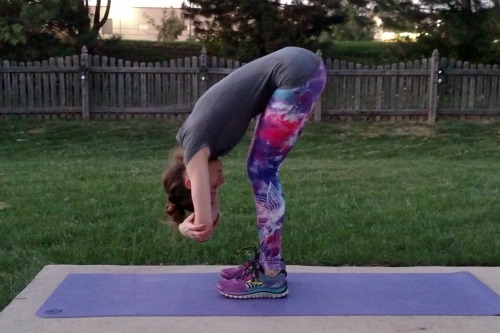 Runners: do you have any favorite gentle yoga poses? Thanks, Andie! I really love them. I’m a sucker for a great pair of leggings. What a great collection of poses. Some of my favorites! I have to say my absolute favorite is downward dog. It hits all the spots! It really does. And it helps build upper body strength, too. Love. Thanks for the tips! I kind of want to do these right now! Thanks, Kristen! 🙂 Hope you enjoyed them if you got a chance to try them!